Lord Jagannath – The God of the Universe has different forms. He adopts these forms according to the necessities of his devotees. In Jagannath Temple Puri; the Lord is adorned with cotton and silken fabrics, gold ornaments, flowers, precious stones, leaves and sandalwood every day. In total, there are 32 Bhesas (forms) which Lord Jagannath, Balabhadra, and Subhadra. Among all forms SunaBesa is one of the most looked upon by the Devotees as it is done in the great chariots. It is done on Ashadha Shukla EkadashiTithi. This year it is going to celebrate on 23rd July. This is also known as Bada TadhauBesha. In this, the Gods and Goddess are adorned with beautifully carved Gold jewelry. They are loaded with precious stones and the yellow shine of the Gold from top to bottom. Below given is the image of SunaBesa. This form of God is put into action when the deities return from their visit to their aunt’s place. The chariots of the three Gods are kept in front of the Lion Gate of the Shri Jagannath Temple in Puri and there they are made to wear these ornaments. It is believed that whoever sees the Lord in SunaBesa gets free of all his bad Karmas. 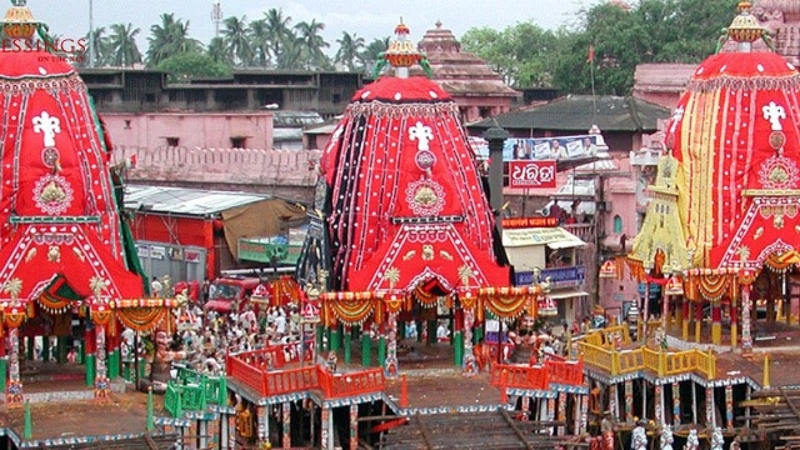 A huge number of the crowd can be seen in front of the temple to feel the power of the Lord on this day.Sunabesa is the last ritual of Rath Yatra. So must visit this time to see golden attires of lords in naked eyes.